Please consult the photograph above for details of the food’s packaging, design and retail presentation. Additional images of the recalled Pork products can be found on the Web site above. According to the USDA, the products subject to recall bear establishment number “EST. 795” inside the USDA mark of inspection. These items were shipped to retail locations US nationwide. ==> To see other recalls and notifications caused by contaminated, adulterated or mislabeled Pork Sausage products, please search for “pork” using the Search Box at the top of this page. If you have any questions about this recall notification, please contact Mr. Gary Brooks, Vice President of Food Safety Quality Assurance for Monogram Foods, at 1-855-556-1351 during normal business hours, Eastern Standard Time, Monday to Friday. ==> To see other recalls and notifications caused by suspected Foreign Object Fragment contamination, please search for “fragment” using the Search Box at the top of this page. ==> To see other recalls and notifications for products manufactured, marketed and/or sold by Monogram Meat Snacks, LLC, please search for “Monogram” using the Search Box at the top of this page. 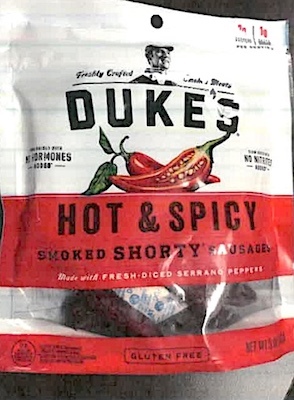 ==> To see other recalls and notifications for products manufactured, marketed and/or sold under the Duke’s brand, please search for “Duke’s” using the Search Box at the top of this page.